It can be tough to keep up with airline and hotel rewards programs and their point expiration policies. Generally, points will expire after 12 to 24 months of inactivity. This means if, during a specified period, you do not earn or redeem miles, you will automatically forfeit them. Some programs will let you resuscitate your mileage balance afterwards for a fee, which may or may not be worth doing, depending on the number of miles you’ve lost. It’s a good idea to use an app or at least a spreadsheet to keep track of the wide range and the number of different programs make it tough to keep track of when points are about to expire. Chase Ultimate Rewards and American Express Membership Rewards don’t expire as long as you keep an account open. This is fairly easy with a no-annual-fee card like the Chase Freedom or American Express Everyday card. These points can really come in handy when your other rewards accounts are on the brink of expiration and you need a way to keep your account active. You can transfer Ultimate Rewards to United, Hyatt, Southwest, Marriott/Ritz Carlton Rewards, and Virgin America Elevate, to name a few. Membership Rewards can be transferred to various programs, including Hawaiian Miles and Virgin Atlantic, though transfers aren’t instant as they usually are with Ultimate Rewards. 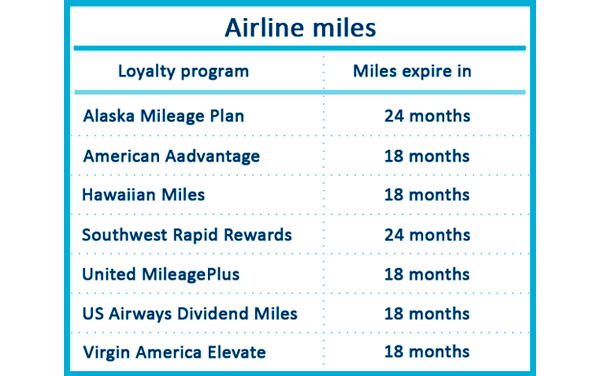 With Skymiles being so heavily devalued and premium award space becoming more and more sparse, it’s a good thing Skymiles don’t expire. This buys time for people like me, who have less than 10,000 miles from a flight three years ago and no desire to pick up a co-branded credit card to top off the balance for an award. Because the miles don’t expire, members can earn them whenever they have an opportunity and redeem them when its convenient. If you’re wondering what the point expiration policy is of the major domestic rewards programs, they are outlined below. For tips on how to keep these miles and points active be sure to monitor your activity to keep your rewards from expiring.